Viviane, this recipe is the BEST! I have made it twice, and I am obsessed with it. My roommate told me it reminded him of a great, local mom and pop pizza shop from growing up in NJ. Any recipe that elicits nostalgia like that is a winner in my book! Thank you for sharing! What’s the best way to store this dough so that I can make it in advance without sacrificing the fantastic texture of this dough? I would like to double batch it and store balls of dough for weeknight use. Any advice on scaling up and making in advance? Christy, I am very sorry for this terribly late reply… I’m afraid the question you had is now irrelevant. But for the future, you can make the dough up to 36 hours before you use it and keep it refrigerated. Take a look at Step #2, for the instructions. I do not recommend freezing the dough, as it totally ruins its texture. Thank you so much for your note and happy pizza making! I’ve been making homemade pizza for years all pretty good using All Trumps flour and some bread flours but I want to try 00 because many prefer. We like NY style thin crust pizzas. I agree with everything in your recipe and the proportions except one important thing. Usually when i make pizza and even most recipes out there even from the experts indicate that 500 grams of flour using a 65% hydration yields two 15-16 thin crust pizzas so I am confused. I don’t see how 310 grams of flour can yield two 16″ NY style pizzas. What am I missing because All Trumps is designed to make thin pizzas and mine come out pretty thin using 500 grams sometimes 480 grams. Thanks so much, just wanted to know before I try 00 flour and your recipe. Hi David! I am thrilled you will give the 00 flour a try. 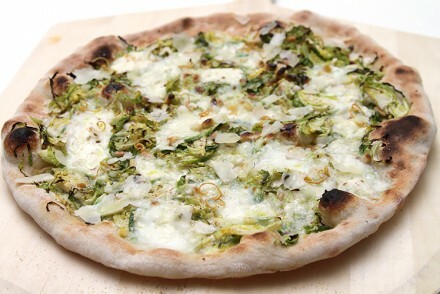 It is exceptional for making pizzas. As for the measurements, I stretch my dough pretty thin and I have no problem getting two pizzas out of this recipe. You can see it in the video. Best of luck… and most of all, have fun! I followed this recipe EXACTLY and had enough dough for TWO 16″ pizzas. It was easy to stretch, was nice and thin crust, and produced as great a pizza crust as I have ever made. I used Caputo TIP0 “00” Chef flour. After initial raise I left in fridge in plastic bags overnight as directed. So 24 hour ferment. I am so confident I am having a pizza party tomorrow with a bigger batch !! Hello Mike! My apologies for this terribly late reply and thank you so much for your comment – just made my day! I am delighted the pizza dough recipe worked well for you and I hope your party was a smashing success! perfect. It was the best pizza I had ever made. Sorry I accidentally press the send button before I could fill in my email details. Thank you, thank you so much for your pizza dough receipe, it is the best. PS: I would recommend your pizza dough to all my friends. Dear Rebecca, my apologies for this late reply to your wonderful note. I am thrilled that this recipe was helpful – just made my day! I hope you’ve been enjoying making pizzas often… and will continue to do so for many moons. A heartfelt thank you for your comment! This is the best by far and WIDE the best technique I have found. Love it! I use the 00 caputo flour and all is well with the first bite. Thank you for giving me a way to have (almost) brick oven pizza! Now to learn the technique with a pizza peel, it’s one hard technique! Thank you so much for you comment, Kiowah. I am thrilled this recipe worked for you. 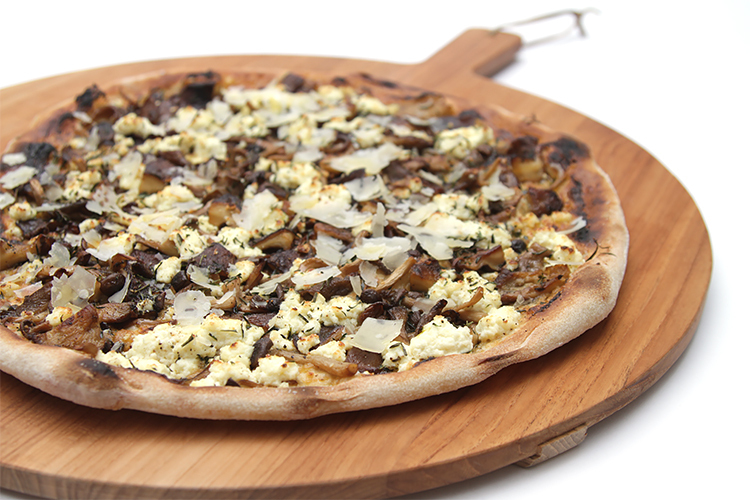 After making pizzas with a peel a few times, you’ll become a pro. It’ll then be “an easy technique”! Hi! Trying this recipe currently!! We have had terrible luck (I guess) with our stones cracking when turning the heat up to 500°. I didn’t think stones were able to take this much heat. Any advice? Hi Michele, Thank you for your note. I am sorry your stone cracked – probably due to improper manufacturing or quality. I have two stones that are now 15 years old. I use them on a regular basis at 550F and they’ve never cracked. When purchasing a new stone, make sure they’re meant to take high temperatures. For example, I put a link for a stone in the ingredient list of this recipe. Take a look at it. This stone can withstand temperatures up to 2000F. I hope this helps… and good luck! Do you think the hand kneading, produces superior results over a Kitchen Aid with a dough hook? Hi Paul, I’ve always kneaded my dough by hand. It makes me feel connected to it and in that way, my pizzas turn out the way I want them too. But I’m sure your kitchen Aid would do a good job too. Perhaps you should try both ways and see what happens? Do let me know how your pizzas turn out! 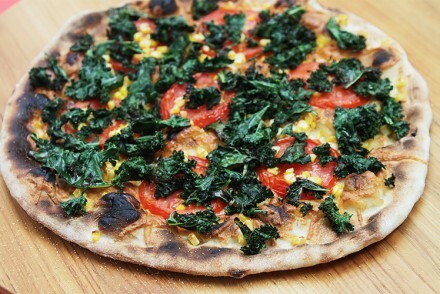 Hello Viviane,I recently read and watched your video on pizza dough. My question is can i mix cake flour with either bread or all purpose flour to substitute for 00 flour,if yes please give proportions used for mixture. 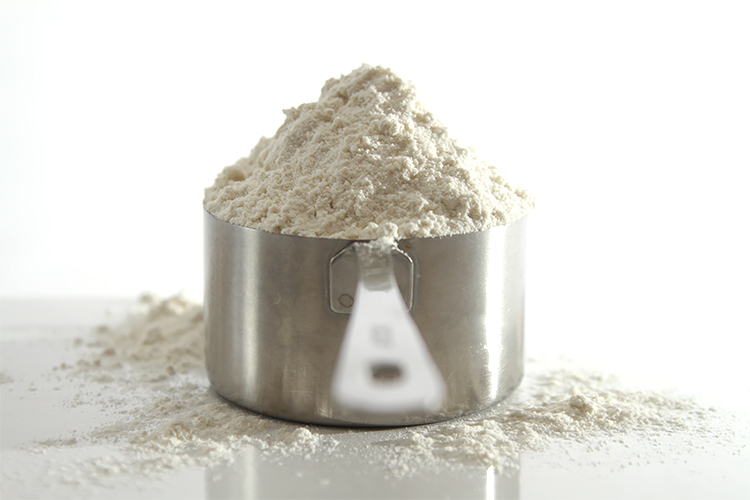 Hi Ronald, I recommend you using bread flour for your pizza dough, not cake flour… If you look at the list of ingredients here: http://foodandstyle.com/pizza-dough/ you will see my recommendations. Good luck and have fun making your pizza dough! I just tried to make a pizza this way but I couldn’t get the dough to stretch out. What was I doing wrong? Hi Teri, my apologies for this late reply. It sounds like your dough hadn’t risen enough. Also, make sure you don’t handle the dough too much before stretching it. If you get all the air out of it, it will become stiff and you won’t be able to stretch it. I’d be happy to help further if you give me a few more details… Good luck trying again! This pizza dough is amazing. The video made all the difference for a successful first try. There was not a single leftover piece of pizza from even my pickiest eaters! Do you think this recipe would double well? Thanks! Hi Terri, I am delighted to hear this recipe worked well for you – just made my day! And yes, you can absolutely double the dough recipe. It’s a little more strenuous to knead, but you sound like an expert, so I suspect you will have no trouble making it. Have fun! Hi Harry, I am delighted this recipe worked well for you and I admire your creativity with your stove – very clever! And lucky you to be living in Aruba!!! Hi! Can you freeze the dough? And if so, should you freeze it before it’s risen or after? Thanks! In my oven the top of the pizza burned before the bottom of the crust was golden brown? Will it work as well if I just leave the oven on 500 degrees? If I raise the rack higher as heat rises wouldn’t that work? Other than that it was fabulous! Hi Monika, It seems that your pizza might have been too close to the broiler. Try lowering your rack so it’s not as close to the broiler. It’s crucial to heat your pizza stone at 500F for 30 minutes. Then, without opening the oven, turn it off and turn on the broiler to high heat. Preheat broiler for 10 minutes before baking your pizza. Let me know how it works the next time you try… Enjoy and have fun! Hi, I need to be gluten free. Recently I went to a pizza restaurant that claimed they use double zero pizza flour with a free notation process that brings the flour from 75,000ppm down to 12ppm. Is this a recipe that does that? It was the first time in 9 years I had a real pizza, it was delicious & I didn’t get sick! Hi Sue! Thank you so much for your comment. I am not an expert in gluten, so I am afraid I cannot answer your question. However, I found an article that might shed some light on why you may not have had adverse effects to the pizza you were served: https://wholegrainscouncil.org/blog/2012/01/research-sheds-light-gluten-issues It seems that the sourdough process drastically reduces gluten – something that needs further investigation, for sure. Good luck! Do you turn the broiler off after the 10 min preheat before putting the pizza in……doesn’t say. Hi Ed, Yes, you want to keep the broiler on the whole time you’re baking, no matter how many pizzas you’re making. See the last sentence in Step 3. Happy pizza making! I found this recipe yesterday and made the pizza today. It came out fabulous! I used a pizza pan since i don’t have a stone and it came out quite well. My son loved it and suggested we sell them. Thank you so much for the recipe. Your video was also so confidence inspiring. Can’t wait to make it again. Hi Angelo! I am really glad the recipe worked out for you… and I hope you sell tons of pizzas! Your son is most enterprising. Enjoy your next pizza-baking extravaganza! Hi Karen! Thank you so, so much for your comment (all the way from Denmark – hooray! ), I am delighted your dough and pizza turned out great. As for freezing the dough, I haven’t had good success with it. 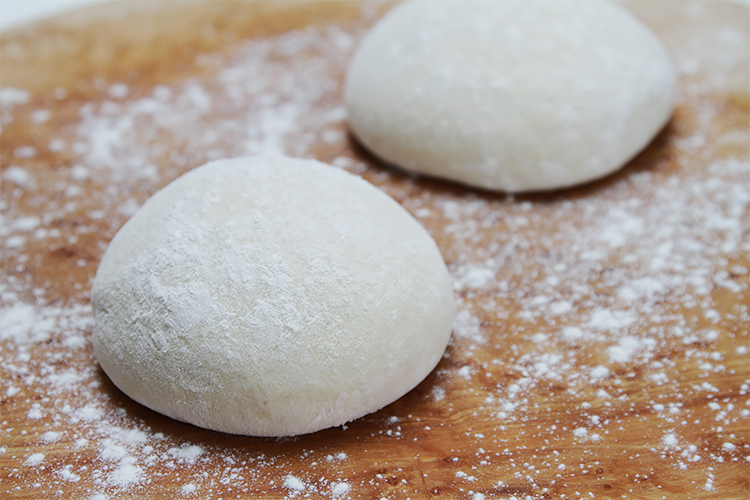 Although the thawing goes well, freezing makes the dough very stiff (crispy) once baked – not at all desirable. So instead of freezing the dough, I simply make pizza two nights in a row. Let me know how your frozen dough works out for you. Thank you again! Hi Viviane. I don’t have the stone to bake the pizza will a normal pizza pan bake the same? Will there be a difference in baking time and temperature too? Thank you! Hello Lat Tang! If you are only using a normal pizza pan, then preheat your oven to 500°F (260°C). When the oven is hot, bake your pizza until browned on the edges. You can finish it for 30 seconds under the broiler if you want the charred edges. Your crust won’t come out as moist as when you bake on a stone, though. It’ll be more crisp. Good luck and let me know how it turns out! Hi. This dough comes out way too sticky, are you sure the proportions are correct? The recipe amounts to 80% hydration which is more than the wettest of breads, and impossible to knead by hand. It comes out of the bowl as a yogurt like substance. I added another 60g of flour and my dough is still sticker than yours. Hi Andreas, I am very sure about the measurements since I’ve made this exact recipe for many years now. Even with giving as detailed measurements as I can, different flours are milled differently and will give you a different result. It also depends on how the water is measured. 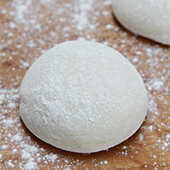 My suggestion is for you to look at the video to see what is the ideal consistency of the dough and follow that. I show how the dough should look like before and after it has been kneaded. Don’t worry if you have to add a bit more flour to get the dough as it is shown. Let me know if I can help further…. and good luck! I thought mine was too sticky at first, too, but i just kept kneading and adding flour as necessary. It works. Very glad to hear this, Angelo!